We’ve liked the creativity coming out of Avery Brewing with beers like Tequilacerbus, but there are plenty of more traditional barrel-aged beers in their portfolio that deserve our attention. 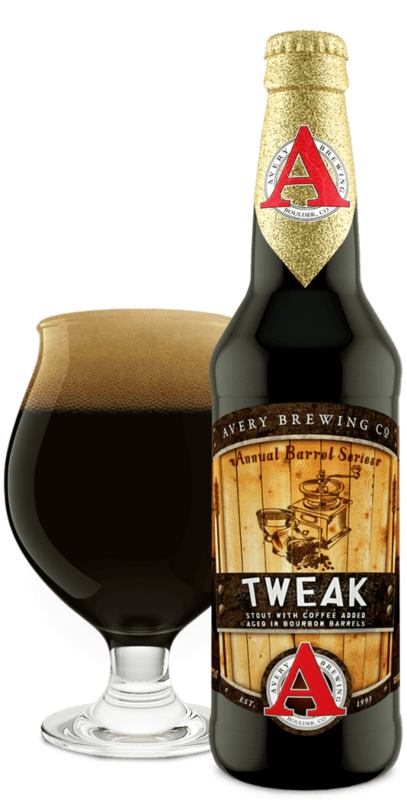 Tweak, a coffee stout that sees four months of aging in bourbon barrels, is part of Avery’s Annual Barrel Series released every November-December. A barrel-aged coffee stout is not exactly uncommon in the craft brewing world. So how does Avery’s effort stack up? Tweak pours a dark roasted color with a medium weight and minimal head. The aroma is nicely balanced with toasty malts, dark chocolate, creamy vanilla, and espresso bean and without any sharpness or excessive alcohol. It clings to the palate without being cloying with flavors that are bigger and richer than the modest nose would suggest. There’s plenty of coffee up front, freshy brewed with an earthy sweetness and notes of juicy raisin, but the buzz is reigned in with enough just-crispy chocolate chip cookie, burnt sugar, and vanilla custard to keep things far more interesting than your average coffee stout. It’s not until the finish that the bourbon barrel really arrives with syrupy caramel, toffee, and toasted oak. It all crescendos with notes of sharp dark chocolate, dried currants, and the milk left in a finished bowl of Cinnamon Toast Crunch. Seriously. One of the best barrel-aged stouts I’ve come across in some time.